You have no idea how easy it is to make CEVICHE! Guys, guys, guys, guys, guys, I’m about to drop some serious, life-changing knowledge on you RIGHT MEOW. Can I get a drumroll?? CEVICHE IS THE EASIEST FOOD TO MAKE. If you have patience that can endure marination, I would even dare to say it’s easier than reheating food in the microwave. It’s THAT EASY. 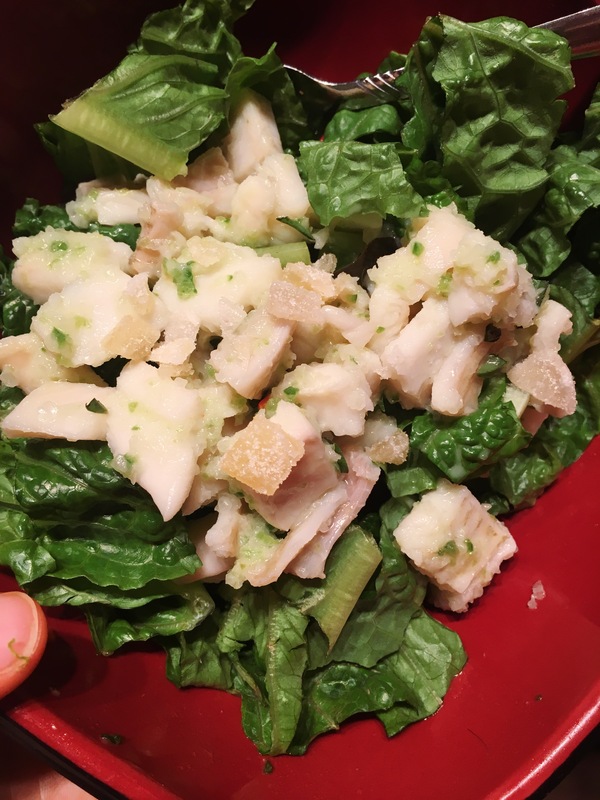 Spoiler alert: All you have to do is cut up fish fillets into small, bite-sized pieces; mix it with lemon and/or lime juice; and let it sit in the fridge for 1-3 hours. That’s it. “What?? ?” I can hear you asking me. Isn’t it beautiful? This ceviche isn’t totally naked. I forgot to snap a picture before I mixed it with the coconut, green chili sauce that the recipe pairs with. 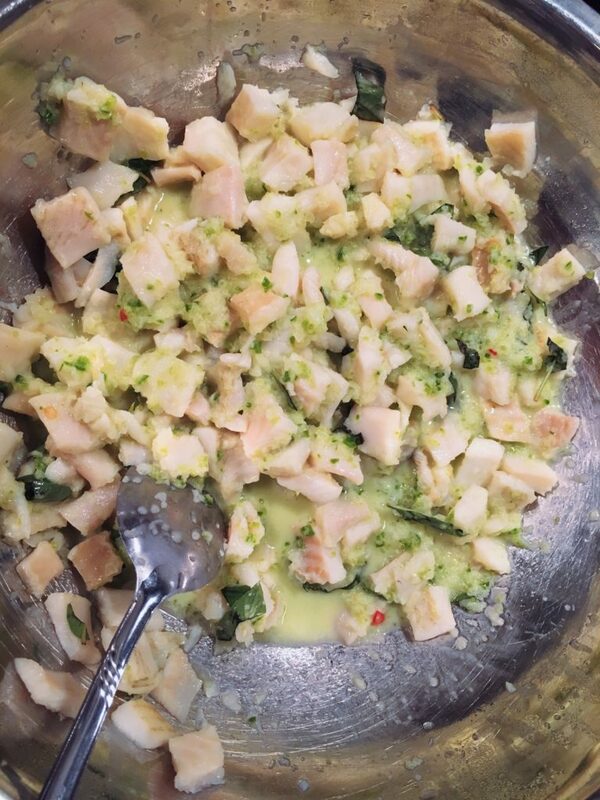 I discovered how easy ceviche is to make thanks to my fascination (obsession?) with the cookbook Tacos by Mark Miller. According to the short bio in the back, Miller is one of the original curators of Southwestern cuisine and splits his time between Santa Fe and Asia. 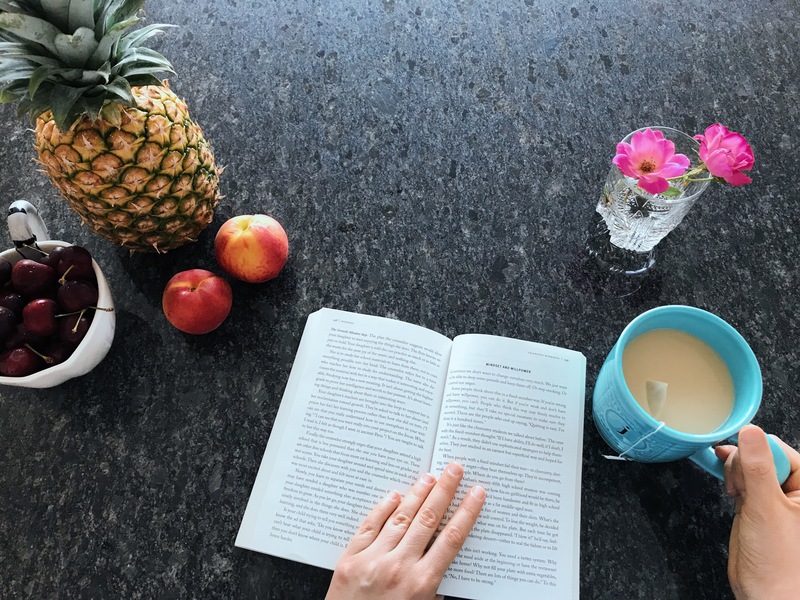 That’s apparent in the book, which derives plenty of its recipes from Mexico and Asian cuisines (I’ll tell you more about the Thai shrimp tacos I made in another post). With the exception of a few fattier or cheesier recipes, most of this collection is a good go-to for clean eating. As you’ll soon learn, authentic cuisine typically uses authentic ingredients. Thank goodness because Taco Tuesday is a staple in my home, and I couldn’t imagine a summer—nay, a life—devoid of salty, spicy meats and crunchy taco shells. Give me tacos or give me death. But as far as cooked fillings go, none is easier than ceviche. I know you’re probably accustomed to seeing ceviche served from some kind of fancy martini glass at an upscale restaurant, but I swear the second you try it in a taco, you’ll never be able to go back to any other method—except maybe as a salad topping, which I initially tried for dinner and didn’t want to have any carbs to disrupt my sleep. That was pretty dang delicious, too. You might be wondering what those glittery-seeming chunks are on top. It’s candied ginger. You can usually find it in the grocery store, sometimes in the produce section with the nuts/bulk items. Other times, it’s with the spices. I’ve also seen it in the candy aisle if your grocery store has those bulk candy containers. I recognize this uses white sugar or, as I like to call it, The Devil’s Sugar (trademark pending). But this is just the teensiest accessory and crafting a life full of clean eating is about making food that you enjoy eating. A sprinkle of demon sugar now and then won’t kill you (OR WILL IT?! Mwahahaha). If you can’t find it at all, you could make it instead, but I think you could probably get away with mixing up a bit of paste with squeeze-ginger and brown sugar to spread onto your taco. I haven’t tested it out so don’t hold me accountable if it tastes like garbage, but I feel like it’s hard to go wrong with ginger mixed with any kind of sugar. The key is to balance out the bitterness with a bit of sweetness and spice. So even a pineapple salsa would probably work (don’t forget to check the ingredients!). Anyway, without further ado, here is your super-easy ceviche along with super-intense (but worth it!) sauce recipe. In a large bowl, toss the fish with the lemon/lime juices and salt to marinate for 1 hour in the fridge. For the coconut-chile sauce, heat the oil on medium-high heat and sauté the onion until just translucent, about 2-3 minutes. In a blender or food processor, add the sautéed oinion, coconut milk, and chiles. Puree until smooth. Strain through a fine-mesh sieve into a bowl. Drain off the marinade from the fish. In a large bowl, toss the snapper with the basil. Drizzle half of the coconut-chile sauce over the fish and use the remaining sauce as a dip for the tacos (or just dump it all in like I did, whoops). Serve immediately. Miller says to put lettuce on the bottom and in hindsight, I do believe that would have worked better. The ceviche is nice and juicy and soaked through the taco shell a bit. *Most places do not have red snapper or if they do, it’s either a lie or wildly expensive. Miller says you can use striped sea bass or halibut. I used flounder and it was still delicious. **In the age of modern technology, I do not and will not make my own taco shells. 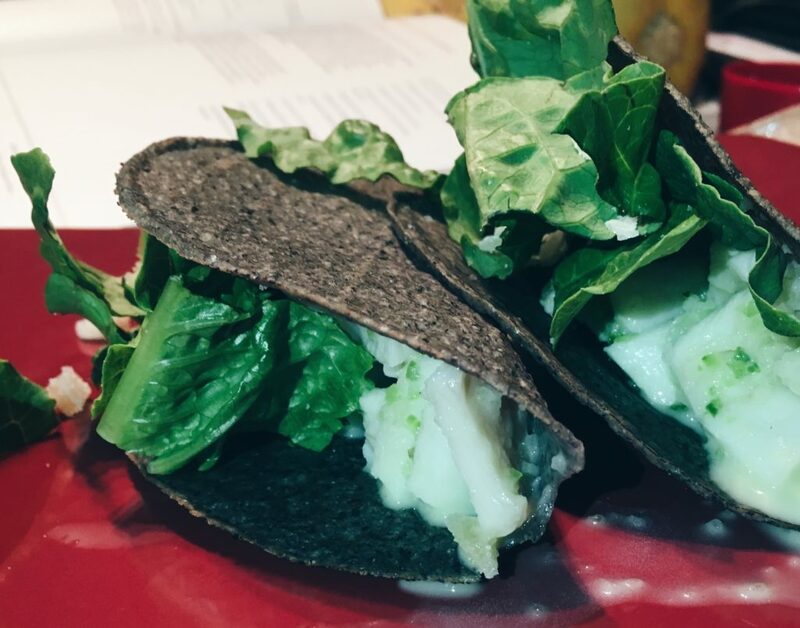 I got these blue corn taco shells from Ortega Good Grains because I’m a sucker for novelty, but they also make yellow taco shells. Both types are totally clean and delicious!